It is truly tough to interview a candidate for a job position. There are many things you need to evaluate before you pick your best candidate for a certain role. Here we have explained a step by step process that will help you evaluate your candidate properly before selecting him for a particular role. How to Shortlist Candidates By Going Through Resumes? The first step in finding your perfect candidate for the job is shortlisting the best resume. Once you place an advertisement on the prominent job portals, you will come across endless responses. Many candidates will respond to you with their latest updated resume. You need to sort out the eligible ones out of the lot. You need to evaluate the shortlisted resume and see which of these have been drafted well and in proper format. The candidates who have sent you well drafted resume written in correct grammar are surely more serious about the job opportunity. Get in touch with the shortlisted candidates through telephone or e- mail. The interested candidates will get back to you. Wait for their response. How to Decide the Type of Interview Best Suited For the Candidate? You may get countless responses from candidates around the state. It is also possible that individuals living in far off places get interested in your job opportunity. You need to fix an ideal interview option for the candidate keeping convenience and feasibility in mind. There are many different styles of job interviews possible today due to the modern technology. You need to pick the best option that will suit your candidate and you. Here we have listed out a few job interview styles for you to choose from. 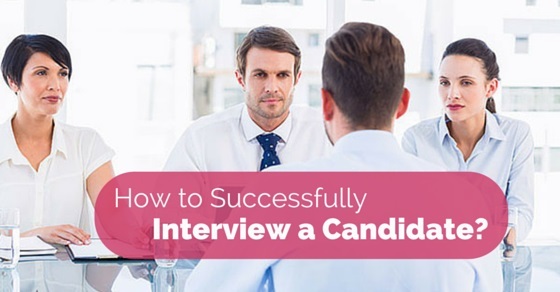 If the candidate is from the same state or stays in the vicinity, the best interview style would surely be a face to face individual interview. In the interview, you may ask a combination of professional, technical and basic personal questions. Ask questions that help you evaluate the candidate for the chosen position. If you have numerous candidates even after shortlisting, you may opt for group interviews. The merit of a group interview is that you can interview number of candidates in a single sitting. You may have a single interviewer or a pair of them to interview five or six candidates. Group interviews are great if you are hiring for sales or marketing profiles. These are job profiles where you require aggressive, enthusiastic and confident candidates. Group interviews help to clearly identify such candidates. The drawback of group interview is that you cannot get ample time with individual candidates and you will require a round of personal interview to get a clear idea of the skills of the candidate. All the candidates for job interviews may not reside in the vicinity. Some of these job aspirants may be residing in far off destinations. In such cases, it is not always practical to call these candidates to the venue even for preliminary rounds of interviews. This is when video interviews are a great option. You may use Skype or Google Hangouts to interview candidates online and get the real life feel. There are some things you need to keep in mind while conducting a video interview. Here we have listed these significant points for your reference. Always check your laptop one day before conducting a video interview. Ensure that the webcam and the speakers are functioning properly. Ensure you have sufficient internet package to conduct the video interview without interruptions. Arrange for the interview in a room where there won’t be noise or interruptions. Keeping these points in mind ensures that you are able to conduct the interview at the scheduled time without problems or issues. Prepare a list of questions for the video interview well in advance. Observe whether the candidate logins in for the interview on time. This shows how serious and disciplined the candidate is. You may also observe things like the candidate’s dressing sense, confidence and language skills through the video interview. It is better not to hire the candidate based on a video interview and have a final round of interview in the office. Telephone is a great medium of communication and many firms and organisations use it to conduct preliminary rounds of job interviews. Telephonic interviews do not permit you to view the candidate but still there are several factors you may assess even on the telephone. In prescheduled phone interviews, you get to check the punctuality of the candidate. While you can’t observe the gestures and postures on the telephone, you can still assess their tone and style of speaking to understand their knowledge and confidence. In case of telephonic interviews, you need to be careful to select the questions correctly. It would be a good idea to select subject related questions to assess the person’s knowledge regarding the subject. If a candidate is too nervous or scared, you may hear him breathe heavily on the phone or even sigh. These voice gestures tell you a lot about the candidate. Individuals who lack confidence fail to make important decisions related to work and cannot be relied on. Confidence is thus a vital trait in all job seekers who aspire to occupy responsible positions in firms. The enthusiasm to do work properly and try out new methods helps the organisation grow. Candidates who possess such qualities are ideal for important positions in firms. Very few candidates know how to work in a group or a team. These individuals are capable of getting work out of others by co-operating, encouraging and motivating. Candidates should respect and value time. They should reach the venue of the interview on time. If there are any delays in reaching the venue, the candidate should have the courtesy to inform the interviewer regarding the delay. Freshers are usually candidates who have never worked in an official environment. They can be childish and immature. If the candidate is disciplined, he will learn the work ethics and regulations and behave in a manner that benefits the organization. Discipline is thus vital in new employees. The client sets deadlines and expects the work to be completed within the set deadlines. If there is a delay and the work does not get completed, it causes displeasure. It may even lead to the loss of a client at times. A team can achieve the goals within the set deadlines only when each candidate takes the deadline seriously. You need to pick candidates who strictly adhere to deadlines of the organization. A fresher who is applying for a job for the first time requires a lot of training before he is actually prepared to work. Individuals who possess subject knowledge pickup things faster. It is better to hire such candidates as they offer greater and quicker results. There are many jobs where the creativity of the candidate truly counts. Advertising is one such field. Innovative ideas from candidates can help you create nice ad campaigns that attract more customers. Graphic designing and content creation are other fields where creativity could be vital. In many jobs related to the marketing and sales fields, the employee is under excessive stress and work pressure. He need to cope with tough clients, close deadline, unworldly targets and poor team co-ordination. Employees who lack the ability to work under pressure and stress give up in the course making the situation worse. You need to thus seek candidate who possess this unique ability to deal with excessive stress maintaining a cool head. In jobs where the employees have to interact directly with the clients, good communication skills help build better relations. You need to possess language prowess and good speaking skills. It is a great idea to select candidates who have knowledge of both American and British styles of English. Poor grammar can actually put down good clients. Writing and speaking skills are thus very important in most job profiles. You can successfully interview candidates for different profiles only if you have a thorough knowledge of what is required in your particular field. Only people in senior positions who have knowledge of the requirements of different profiles should interview candidates. Experienced senior level employees are more capable in gauging the best candidates to handle different positions. They are also better at selecting the right questions to check subject knowledge. If such employees interview candidates, they will successfully find the ideal employee to fill the vacancy.